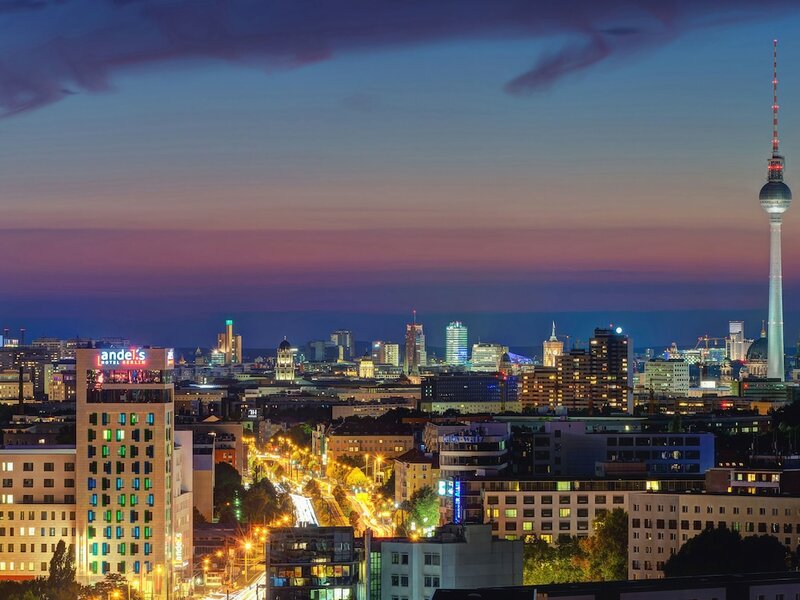 With a stay at Vienna House Andel's Berlin, you'll be centrally located in Berlin, a 3-minute drive from Velodrom and 9 minutes from Alexanderplatz. This 4.5-star hotel is 2.3 mi (3.7 km) from Mercedes-Benz Arena and 2.9 mi (4.6 km) from East Side Gallery. Make yourself at home in one of the 557 air-conditioned rooms featuring minibars and flat-screen televisions. Complimentary wireless Internet access keeps you connected, and satellite programming is available for your entertainment. Bathrooms have bathtubs or showers and hair dryers. Conveniences include phones, as well as laptop-compatible safes and desks. Relax at the full-service spa, where you can enjoy massages and facials. You're sure to appreciate the recreational amenities, including a spa tub, a sauna, and a 24-hour fitness center. Additional features at this hotel include complimentary wireless Internet access, concierge services, and gift shops/newsstands. Enjoy regional cuisine at SKY.KITCHEN by a.choice, one of the hotel's 3 restaurants, or stay in and take advantage of the 24-hour room service. Need to unwind? Take a break with a tasty beverage at one of the 2 bars/lounges. A complimentary hot/cold buffet breakfast is served daily from 6:30 AM to 10:30 AM. Featured amenities include complimentary wired Internet access, a business center, and limo/town car service. Planning an event in Berlin? This hotel has facilities measuring 47362 square feet (4400 square meters), including a conference center. For a surcharge, guests may use a roundtrip airport shuttle (available 24 hours) and a train station pick-up service.